We can’t even think like Jeremy Horn. Any dude that has fought 140 MMA fights is in a different dimension. They probably don’t even think in objects and words but just how many times they can punch things in the face before it drops to the ground. Dude has fought over 100 times and he fights again this Saturday in the Adrenaline III MMA card. Actually I’ve been in 140 fights. A lot of my fights are unrecorded because I was fighting before they recorded fights. Aah…quite a few, I don’t know if I can put a number on it. I would imagine it’s got to be in the thousands. Yeah we met at one of his early fights and Pat Miltech and I went to go watch him fight and he did real well, beat the crap out of the guy and we kind of hit it off from there. But that kind of stuff happens every once and a while but it’s obviously pretty rare. Yeah from time to time I guess. I have a pretty good idea of who I could take. I don’t really think who I would like to fight…I don’t really care just whoever is across the ring is good enough for me. Be sure to check out Jeremy Horn’s gym at Elite Performance. and if you’re in Alabama this weekend, check out Jeremy Horn fight against Chris Davis in Adrenaline III! 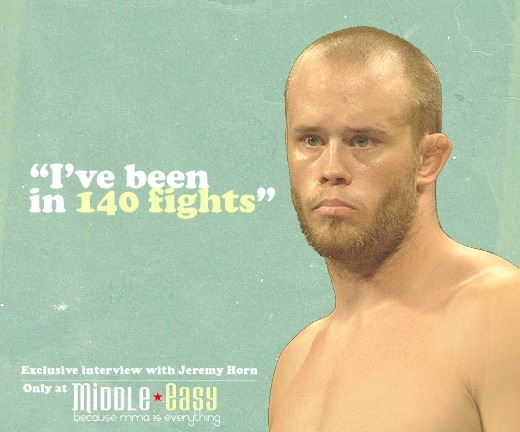 Jeremy Horn is the marathon runner of the MMA and it would be a good bet that he will fight more than any other for some time. Most likely you can place your bet now on gamebookers.com. How many more fights will he be able to be in? Previous articleTim Sylvia vs. Ray Mercer…now with MMA! Next articleBreaking News: Matt Leinart vs. His entire NFL career…confirmed! Wow! He is amazing! 140 fights in his career! I wanted to know if he had any serious injuries or like a torn labrum. I have read that it can be treated in a surgical or non-surgical way.